Supporters and family of Isaiah Tucker demand police accountability and justice for man killed by Oshkosh cops | Fight Back! 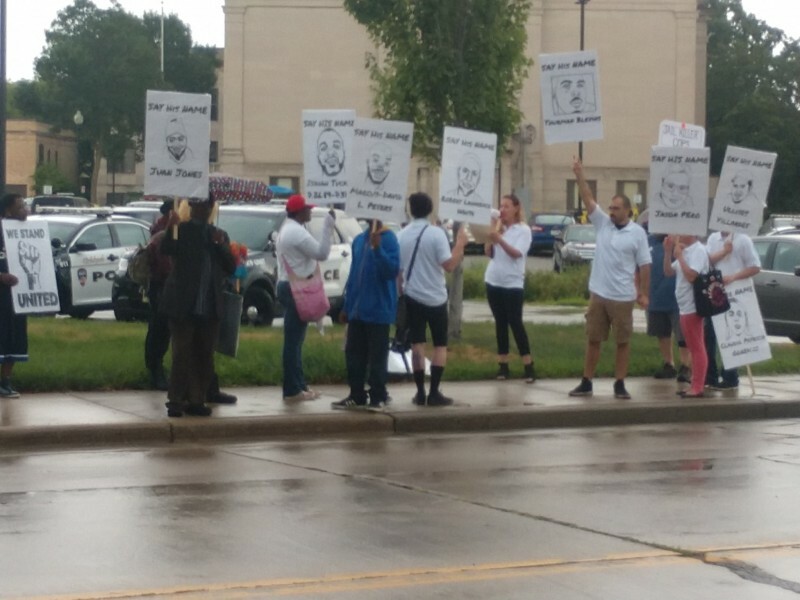 Protest demands justice for Isaiah Tucker who was killed by Oshkosh cops. Oshkosh, WI - On the evening of August 1, encroaching thunderstorms couldn't dampen the passion of protesters as community activists, led by the group United Action Oshkosh (UAO), as they joined friends and family of Isaiah Tucker, a Black man shot and killed by Oshkosh police. The protest marched to the police station, almost a year after Isaiah’s murder, to demand justice. Isaiah was killed by officer Aaron Achterberg and his accomplice officer Kyle Roberts as he tried to flee in a car. The cops fired 11 times into the vehicle as he drove away. The officers initially said he had tried to hit them, but once body camera footage was released the story was changed to them “feeling threatened.” The state justice department found the officers to be justified in their use of deadly force and they were reinstated without punishment. Protesters carried signs with the names and faces of Black and brown people murdered by police since the death of Isaiah Tucker, calling out chants for the end of police brutality and racist discrimination. At the station, the stories of the men and women killed were told by UAO member Lindsey Spietz, with their names then recited by the marchers. A brief moment of silence honoring them followed each name. The march then circled back to its starting point where a few participants in the demonstration spoke. Ryan Hamann of UAO told a story that occurred in 2018 where a white woman fled Oshkosh police in a vehicle and actually struck and dragged officers without lethal force being used against her. Mention was in made in his comments about the connections between police occupation of communities at home and military occupation of whole countries abroad. "Police kill Black and brown people here at home," he said. "The military kill Black and brown people all over the world." Hamann then laid out what justice for Isaiah Tucker should look like, calling for the immediate termination of officers Achterberg and Roberts and the creation of an Oshkosh Police Accountability Council (OPAC), similar to what cities like Jacksonville, Florida and Chicago are fighting for. The event ended with a powerful, emotional speech by Cassandra Tucker, Isaiah’s mother. She spoke of the callous way OPD kept her in the dark, of her sense of loss, her anger and despair, and her desire to see justice for her son. She joined in the call for the officers involved to be fired and for the formation of an Oshkosh Police Accountability Council. "A significant impact of today for me was verbalizing the emotional loss and pain of one left behind after the death of a child to police violence," she said. "No one wins in the aftermath of these crimes. The thing that brought peace to my soul was seeing people of all races, faith, and creeds standing together to demand change for a broken system." This demonstration marks the beginning of the fight for community control of the police in Oshkosh. The struggle for justice for Isaiah and the family he left behind continues.